Daddy’s guilt is Keith boy is the one being affected by our adult problem. Daddy’s heart is indeed very heavy when daddy saw Keith boy. Keith boy kept holding onto daddy’s hand, and pulling daddy to go with Keith boy, as things were before. Sadly, it is not……. I am really sorry to my precious beloved boy. Keith, Daddy is really sorry that daddy cannot be there to accompany Keith boy to play or to go window shopping as we have before. The court order that was finalized had ordered, actually that condition was what your mommy had demanded for our divorce, that for daddy to only see Keith boy fortnightly at a specific day and specific time only, your mommy or a representative has to be present, mind you this condition also applies to Ah Ku or Grandma, as per requested by your mommy although not stated in the decree. Daddy hopes that Keith boy will not see that your Daddy as bad-mouthing mommy. Daddy does hope that Keith boy is going to be raised up well and mommy will see the light of the need for both of us to see each other. As money had always been a concern and your daddy used to exist in this world only as a “money-making tool”, daddy has been busy with work and mommy had indeed made it very hard for daddy to see Keith boy. Daddy had always loved Keith boy and will always do. Please understand that daddy had never intended to abandon Keith boy in anyway. Daddy is very sorry that daddy and mommy's problem had caused Keith boy not to have a normal family. Daddy had tried very hard to make good of the whole situation but always ends up with the same result and problems. If Keith boy ever needed anything, just give daddy a call. For now, daddy will just have to bear with the pain, living without seeing Keith, until Keith is much older and can decide for ownself, because of a very selfish act. Now daddy just hopes that there won’t be any mind poisoning, happening to Keith boy. Daddy does agree that daddy’s decision to move on with daddy’s life has indeed affected Keith boy’s life. But Daddy do hope that Keith boy would realise that we each are given a choice and we decide it all on what our heart tells us to. When love is dead, please understand that the heart is not once broken (a single crack), it is already in pieces. This blog is daddy’s only way of letting Keith boy to find out daddy’s part of the truth. Daddy will leave it to Keith boy to find the truth for own self. First of all, I am pleased to announce that this blog site is now going to be back to normal. For those who still frequent my blog, my apologies for my absence for so long. Hopefully I will be back for good this time. - Since end of last year, we have managed to wean him off his pacifier. - Early this year, he has been potty trained and was diaper-less during the day. - It has been 2 weeks now he has been totally off diapers, even during his sleep. - He is no longer asking for his late night or early morning milk. - He is now alright if we leave him in the public play place without having any adults around. - He is beginning to show signs of socializing with kids. - He spends less time in front of the television now and rather cycles his tricycle in the house and going to the playground near my house. - He is able to sit on the playground swing without any assistance, guidance nor care and he is even swinging by himself. - He astonished me when he demonstrated so much independence when he steadily climbed the spiral stairs of the playhouse all on his own. - A few days ago, Keith just got his buttock scratched by the comb of the escalator. I will write that on another post soon. In the past, I have gotten third party feedbacks that there were some irritated people whom felt that I have been a show-off. Mind you, there is no need for me to do that because this blog is meant to keep track of my son’s development and not a contest. If you feel irritated, please feel free to feedback to me personally or comment. If you won’t then please choose to ignore my blog because I really failed to understand how an update on my son’s development will actually offend anyone. This is an update on me. - It is agreed between Elaine and I that we will try our best to be good parents to Keith and we had both forgiven each other for our past. In other words, it is useless for some people whom are trying to break us up again because there is nothing to break now. o Occasionally she will get strange calls and visit by stranger telling her the “truth” about me. Well, we are both too busy with our lives now and we couldn’t be bothered by all these. A word of advice to the nuisance, the truth will reveal itself eventually; repent before it is too late. The reason why Elaine and I have nothing to fear is because we have both repented and confessed our mistakes and wrongdoings, have you? We were able to forgive each other and ourselves, can you? - Close to half year ago, I got robbed at knife point, I have lost my waist pouch. Although I got scratched in the face and cut on my wrist, luckily Elaine was unhurt and Keith was not around at that time. - I am now working in a company affiliated with Italian, Chinese and Taiwanese principals. The job requires me to travel extensively locally and South East Asia, China, Taiwan and Middle East. - My job has been rather interesting because it involves a lot of technical knowledge in a field less ventured and I have been lucky because I have been able to handle my boss’s “tough” customers well and they even treated me very friendly after getting to know me. Much to my boss’s surprise we even became very good friends. - Close to 2 months ago, my car was stolen when I went to attend a charity event in Pahang with my colleagues and boss, not only have I lost my personal belongings inside the car, I have also lost my certificates and testimonials. My boss is now providing me with a company car. - My boss is bringing me to church and FGB meetings. In fact with all the bad luck events happening to me, I am really grateful that he saw those as a challenge and not seeing me as a black sheep. - Lately I just got a really great job offer, which is offering me almost the same to my salary, minus the un-necessary entertainments so I am deeply considering it. My boss told me he will let me go, if he sees the Offer Letter. I am very sorry for not being able to update my blog as often as I like now. Life is indeed very hard especially when you have to work things out from scratch without much help and support. Luckily I found it lately with much understanding. I know that I have been absent from my blog for over 2 months now. I am taking this opportunity to start writing again whenever I can find the time to. My sincerest apologies to all that have hopped over to my blog only to be disappointed with the same old posting. 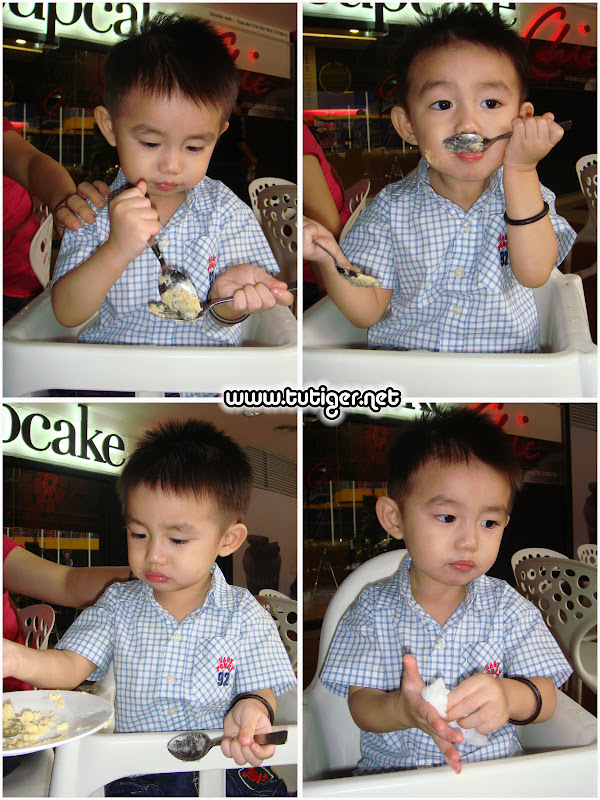 That day was not really an eventful day but it has been a very tiring day for all of us, including the Birthday boy. Elaine wanted to get cupcakes from Cupcake Chic so they bought two to try and sadly they were not to our liking, with Keith being the only one wanting to eat one cupcake and smashing the sweeter one. Guess the cupcakes were not to our liking. After the cupcake we decided to go into the Curve because it was raining heavily and I have parked my car in the basement parking of Ikea. 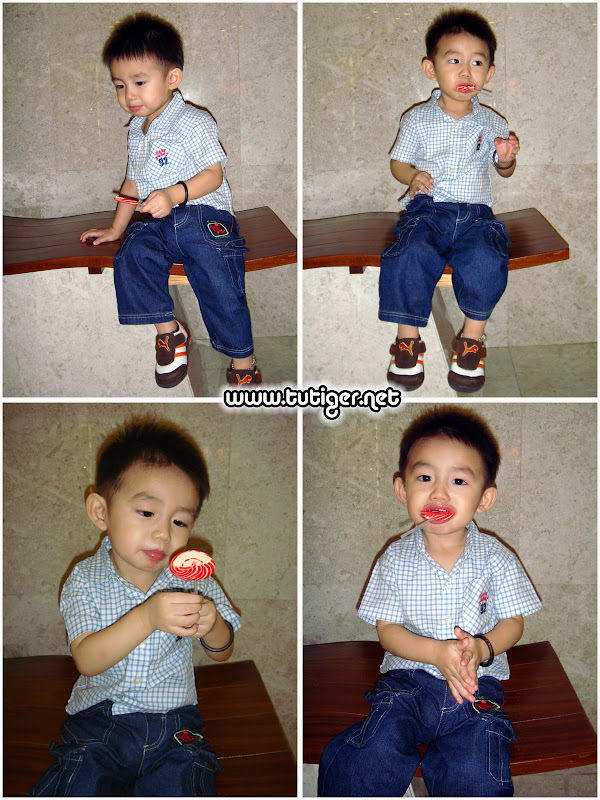 While walking towards the entrance, Keith saw the candy shop and immediately he helped himself to pick the candy :P We can really see that he indeed enjoyed himself with his lollipop candy although he cannot finish it. He even sat himself on a bench to enjoy his lollipop. Right after that, we decided to go to Jelly Q to get a jelly instead. Everybody decided to go for the steamboat opposite of the confectionery shop because we were all so hungry. I bought him a balloon, which he had used to repeatedly hit my sister on the head with, as well along with the gifts he got from us. I gave him a Swarovski Crystal Pig (for keeping) with a fake W910 display phone, my mom gave him a small golden piggie pendant and he also received a Jumbo-size Barney from a very good friend of my sister and I. That did not conclude the day, we went to the Food Foundry to get a Mille Crepe Cake for all the adults and headed to a small restaurant in Taman Desa for our dinner before sending Elaine and Keith home. As usual Keith would whine when he sees me leave but I am glad in a way that Elaine and I are trying to work things out in our own ways. I have managed to see Keith as per the agreement that it has to be in the presence of, and it was with Elaine for the past few weeks but the trouble is we still have our BIG fights. I guess it is rather hard to working things out and I am really hoping that we can start everything anew as friends. I am rather overjoyed because Keith has been rather ecstatic to see me and he is still just as attached to me but of course he has gotten more attached to his mom. Keith has gotten quite demanding and has began to order around, even starting to ask for things but the good thing is we can still talk him out of it or to promise him to give it to him later, then he is ok already. All we need to do is to be really angry or when he does something really wrong, he would come over and keep giving the angry one his kisses. Well, as for the toys I have given him, he is not too interested in it because I know that he had always wanted someone to be there playing it with him, only then will he be interested. Of all the toys, the one he had like most is the bus toy and the drawing table. But we all know how kids are, they always change their preference almost on a daily basis. I wanted so very much to post up his pictures here but Elaine made me promised that I will not post his pictures up until much later on, for reasons I dunno why. Sigh! Before that I have went to the e-Toys warehouse sales to buy toys for Keith and a birthday present for Nicole too. A bus with alphabets and phonics. To him this is another car toy. And lastly this standing drawing board is for Nicole but now I got to figure out how to send this one back to her. I have also bought a Vtech Floating Boat and got a free RC Helicopter from their lucky draw. I guess from next few months I will have to be really thrifty and to spend as little as possible. I might have to even skip some of the things that I really needed, like getting a new pair of spectacles to replace my 3 years old glasses. I was just trying to teach "A" a lesson because I never liked being ordered and being bossed around (nobody does!) When I made my choice not offer my help to "A" because I wanted "A" to know what it takes for me to do the job. "A" tried to get the job done and was really unhappy about it. In the end when I tried to let "A" know that I faces the same helplessness when I am ordered to do the same job, I got battered!!!! and battered badly too!!!! Sigh! So much for a freedom of choice!!!! Sad to say tht the A in the quote refers to Elaine, and when I say battered, she had slapped me so hard that my glasses flew off and punched me in the chest with all her might...... For those who might see this as a minor thing, she did this in the restaurant during business hours when it is half filled with people and also right in front of my mother. She kept punching me until my mother has to come over to stop her. It is not that I cannot defend myself but I was afraid that my retaliation will cause her injury so I have to bear it. Instead of confronting her and make matter worse, I opted to run out of the restaurant and seeing her being so violent, I took Keith along with me. I was still being very patient and controlled then. After a few minutes, she chased after me like a mad woman, wailing and all, I still walk on ignoring her. Then she confronted me in front of Citrus Park and snatched Keith away from me. During the commotion, Keith was unhappy about her shouting at me, so he cried and I have to let go of him so that she would stop struggling. I hated it when she always uses Keith to threaten me. I walked on leaving her and she walk back to the restaurant with Keith. I do not wish to go into detail of what she shouted, all I can say is, it is not nice things :( We argued but I kept my temper very well that day and avoided hitting her when she keep trying to coax me to...... I chose to walk away. I was in dire need of a friend to talk to that day but I didn't call anyone up. I was really lucky that my mom and sis has helped me out that evening. I will stop here for now so that I can take my mind of it all for now. I have bought myself a new handphone lately because my old Nokia has been bugging me with quite a number of problems. I have many customers complaining to me that they cannot call me when my phone is actually switched on with full signal bar. Rubbing salt onto my wound, surprisingly Maxis doesn't SMS me back about my missed calls too. When I am on the line with a customer, I keep getting dropped calls. Initially I thought all this problem was from Maxis but then I tried to use an old handphone and it worked fine without any problem. I wanted to continue using the line with that phone but Elaine wanted to use that phone instead. I ended up having to get a new phone. I really liked the phone, especially the touchscreen and best of all the response time is rather fast compared to my N73ME. As for the N73ME, I am passing it over to my mom because she has always bugged me that my sister's Samsung phone is too soft for her. Hope she can bear with the slow respond time of the N73. Starting on a new job is indeed very hard when you have to really juggle between work and private life. I just hope that everyone will have a little more patience with me and my blog. I have been feeling rather guilty because I have to take some time off to settle down my things. The only hint that I can crop right now is I will try my very best to post up the latest happenings. I would also like to take this opportunity to inform all that I guess it is time that I turn this into my own personal blog. As there might not be any turn to the events that has happened and what is to come is unavoidable. To those who know what I meant, please keep it all to yourself. I only have myself to blame for what that had happened. Some of you might have known this (especially those in Facebook) but I guess it is time that I do a small announcement here. I have already left the restaurant and right now Elaine and her family is running it. Life goes on no matter what and I have just started on my new job as a negotiator in the real estate. Right now my job is to get more listing and to gather as much info as I can from all parties involved. I am very grateful that I have joined a very supportive company with many people whom are more than willing to help me in my job, which is a rare in this line. I am very sorry that I have made this "father writing about his family, especially his son" blog into my own personal life blog but I do hope that I will be able to do some, if not more, of what I have started out this blog for. "Yes, there is no turning back to what is about to happen and I am willing to accept all the consequences"
I am really thankful to have supportive friends during this period of time and as I have promised to you all, I am now standing up for myself after such a very long period of time of darkness.